Poor wee lamb, what an unpleasant way to go! Nicely done, Alex. When I look at quite a few of my older images, I’m finding parasites, mostly mites, I didn’t notice at first. 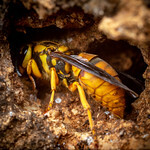 With all those bristles, how did the wasp lay those larvae in the first place? I’d say it’s sad, but it’s life in nature. Well, it’s still sad actually. I was just looking at some photos I took of a leaf-footed bug with tachinid eggs around its thorax and head, so your photos immediately rang a bell with me. Despite the poor caterpillar’s grim prospects, these are fantastic shots! I hate my load of parasitoids. 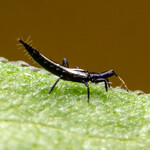 Nice photos, even without mites, although leps do have quite a few. Quite a few years ago (1975) Cornell University Press published Asher Treat’s beautifully written book on ‘Mites of Moths and Butterflies’ for anyone who is interested. What fascinates me about these creepy hymenopterous thugs is how few are known to attack mites. Except for a few encyrtids with records on ticks (by species of the aptly named Ixodophagus), an Australian caeculid mite parasitized by another encyrtid, and a bizarre Chinese eulophid (possibly the same family as what is on your arctiid?) that eats gall mites within their galls – which I suppose could be called serial parasitoidism – mites get a free ride from the Hymenoptera.